Pioneer Electronics has released firmware updates for both models of its AppRadio 3 devices. The update is version 8.05 and applies to the SPH-DA210 and SPH-DA110 models. The updates were posted on October 17 and have a couple of improvements. If you use an iPhone 5 or a Sony Xperia phone, this update applies to you. If you do not own an iPhone 5 or a Sony Xperia device, there is no need to install the update. I think that means that newer iPhone 5S or 5C owners can skip this update. It's surprising that these users have not been included for the update. Unless whoever wrote up that notice meant to include all iPhone 5/5S/5C users. This update applies to only Pioneer AppRadio 3 (SPH-DA210 and SPH-DA110) devices sold in the United States and Canada. You will need a USB flash drive to perform this update and a file decompression software like WinZip. Mac users may want to read this post before updating. The USB flash drive should be 128MB or larger and be formatted to FAT32. It should not contain any files on it. Click this link for full instructions. The links to download the firmware from Pioneer Electronics are below. Recommendation: If you use a Sony Xperia device and wish to connect to the AppRadio via MirrorLink, this update is a no-brainer for you. Go ahead and get it. For iPhone 5 owners like myself, it's a toss up. Here's why. I haven't had any issues when using GPS apps with the AppRadio 3. If this is the only improvement I'm getting, I am more than willing to skip this update. Some AppRadio firmware updates in the past have been buggy and my belief like most others is, if it ain't broke, don't fix it! If you have had issues when using GPS apps with your AppRadio 3, go ahead and do the update. Let us know how it goes and if you see any improvements. I'd be a lot more enthused if there was an update for first generation AppRadio users adding iOS 7 support but that hasn't happened. It is looking less likely now that an update like that would ever be released. One can only hope! Joshua, you didn't run an extension or route your cable where it can be accessed? Ouch! This update has been in the EU for a month now. 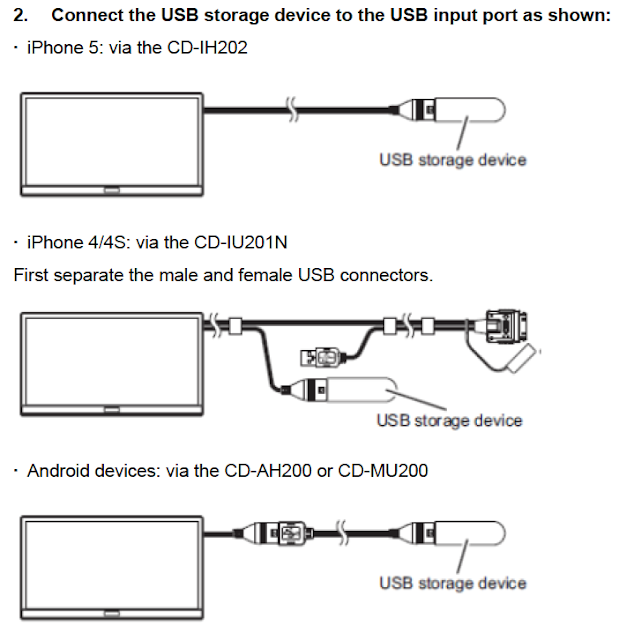 not really any changes - GPS still "slow"
I run the iPhone 5 BUT I did run a Male/Female USB extension cable from the back of the AppRadio3, so I have that extra cable available. It also means I could easily switch to Android if i wanted. Just a thing I recommend people should consider when wiring it up. I just installed this firmware update since Waze freezes occasionally with the 8.03 firmware currently on my appradio. Once I unplug the phone waze works fine so I think it's the radio and not the app itself. the firmware update button is grayed (inactive) for me. Im no sure why this is. I did make sure that the parking brake was engaged. anyone else have the same problem? I am connecting the usb stick via the CD-IH202 that i use with my iphone 5. Download the manual. You probably have the device setting at iPhone/DV. You have to go to settings change the device to OTHER. It's a simple process and is found on page 63. Follow the directions and your ipod and Apps icons will light up and you are ready to go!